Hollywood on Booker Hill | Are You Zhazha? I’ve seen quite a few interesting things while growing up in my childhood neighborhood in Weirton, West Virginia. There was the time someone stole a roll of our old carpet off our back porch. Two other times, some high school boys thought it would be hilarious to build anatomically correct snowmen on our front steps. Another time, my friend and I thought it would fun to tie blankets together to climb out of my second story bedroom window – you know, like they do in the movies. 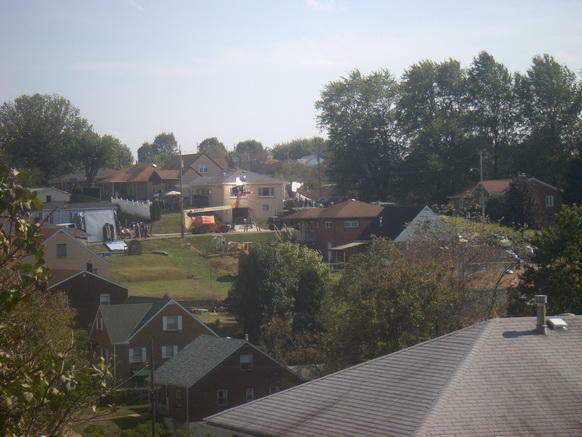 Well, now the movies are in my backyard but I’m sadly not there to see it. I’m living through Facebook pictures, news stories and the detailed descriptions from my mom. She and the neighbors we’ve lived next to since before I was born are now outsiders in the middle of movie making. It’s a J.J. Abrams and Steven Spielberg movie called Super 8 and it’s unreal. Although the neighbors are excited about the opportunity, they’re having to adjust to the change in their day-to-day lives – having to park blocks away and walk, people and movie props (tanks!) all over the place, movie people using my mom’s planters as a garbage can (they cleaned it up) and the security guard who shined his light in her face as she walked to her house. (He said, “I’m the security guard.” She replied, “I’m the neighbor.”) Our one neighbor was also getting a little uneasy about how they kept wanting to use more rooms of her house. They had already gutted the living and dining rooms of all their current possessions to transform it with 70’s style decor – then they added the kitchen, a bedroom and the garage to the movie set. My mom also keeps saying, “I can’t believe how many people they need to make a movie!” Still, it’s hard to complain about something so incredible and they are all anxious to see what it will look like on the big screen. Movie To Begin Production in Weirton W.Va. I just hope it all turns out to be a great thing for Wild, Wonderful, (Weirton) West Virginia. The city has had its hardships (terrible flooding and a huge hit to the steel mill) and some of the scenery has changed (a “Cafe and More” with video gambling in it on almost every corner) and this movie seems to be a boost for the city. I love my hometown, always have. I would probably still live there if another love (hubs) didn’t have to listen to the Army and move to another state. Funny how we chose a town that reminds us of Weirton, only with a southern spin on it. Good luck, Weirton! I hope Hollywood is kind to you. ← Too Much Skin for Sesame Street? What a nice write-up! I’m one of the few who have been blessed to stay in my hometown…and I’m thankful everyday. It means so much to hear of your sentiment for your hometown. And Weirton misses you guys too! Thank you! Weirton will always be in my heart. Neato! I grew up in the same neighborhood. Too bad they didnt pick my mom’s house. Its still decorated like the 70’s LOL.